I figured out how to add new products to our website Weber's Cabinets, Inc. and the Chef Board was one of the first I wanted to add! 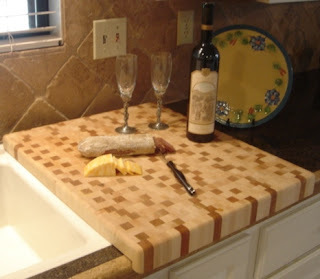 I think it is so practical for a cutting board. Its actually almost too practical because I hate to prep for cooking, cooking, thinking about what to cook, etc. etc....and I love the thing! And I am not just saying that because we make it but I am saying because it is so accessible, easy to use, and beautiful on your counter. Every person has a unique situation and it might be the perfect thing for you to save your cabinets, but on the other hand it might not. If you decide to put new countertops in the kitchen and you want to just reface your cabinets with another wood and finish, it will cost just as much to reface as it does to put in new. On the other hand if you decide you just want to "freshen up" your cabinets and sand down the doors and frames and put on a new coat of the existing finish then that will save you a HUGE amount of money to do it that way. Its all in a matter of whether you are happy with the wood and finish you have or not. Give me a call at (209) 368-0703 at Weber's Cabinets and we can figure out the best situation for you and your kitchen! Right now I am sanding and refinishing the doors for a kitchen in Lodi and making them look brand new. Take a look at the video and see what you think! Here is an update on how its going on my kitchen. As I may have mentioned before or not I HATE living in messes and this is one of those projects that causes a mess. Hopefully it will be all over soon and I can enjoy a nice newly painted kitchen with new doors!